Xin-Xin wearing Freja with Seidr textures. Xin-Xin has texture from the Freja set. 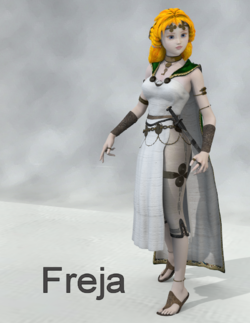 Freja set for Aiko 3 is a complete character for Aiko 3, consisting of a morph, a hairdo (sort of a loosely-tied ponytail), and custom wardrobe. She was created by Fredrik. Outfit consists of shoes, pants, dress, jewelry, cloak, and dagger. This page was last edited on 2 August 2018, at 20:43.